Stiebrs Farms was founded in 1953. We are now three generations strong with the fourth up and coming. Stiebrs Farms produces, processes and distributes all of their products on their own in the Pacific Northwest region. Stiebrs Farms Sunrise Fresh label hens are raised in large cage-free henhouses, in which hens lay eggs in nests and are free to run, preen and socialize. They are fed a pure vegetarian diet of corn, wheat, barley and soy, and never receive hormones or antibiotics. 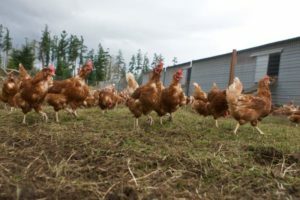 The Stiebrs’ flock of omega-3 hens are also fed organic flaxseed. Stiebrs certified organic and pasture-raised certified-organic hens are fed organic vegetarian feed and spend time outdoors in pastures. The pasture raised birds get rotated weekly. To maintain the integrity of their organic program, the Stiebrs family owns and operates their own certified organic feed mill. Stiebrs Farms cage-free and organic eggs are Certified Humane by Humane Farm Animal Care.